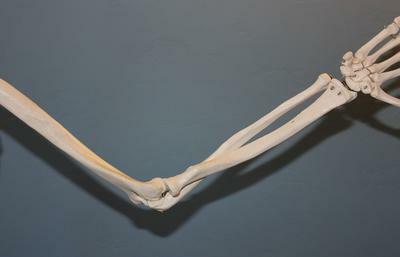 Average adults have 206 bones at full growth. Every single person has a skeleton made up of many bones. These bones give your body structure, let you move in many ways, protect your internal organs, and more. When you were a baby, you had tiny hands, tiny feet, and tiny everything! Slowly, as you grew older, everything became a bit bigger, including your bones. A baby's body has about 300 bones at birth. These eventually fuse (grow together) to form the 206 bones that adults have. Some of a baby's bones are made entirely of a special material called cartilage (say: KAR-tel-ij). Other bones in a baby are partly made of cartilage. This cartilage is soft and flexible. During childhood, as you are growing, the cartilage grows and is slowly replaced by bone, with help from calcium. By the time you are about 25, this process will be complete. After this happens, there can be no more growth — the bones are as big as they will ever be. All of these bones make up a skeleton that is both very strong and very light. Bones Skeleton RibsYour heart, lungs, and liver are all very important, and luckily you've got ribs to keep them safe. Ribs act like a cage of bones around your chest. It's easy to feel the bottom of this cage by running your fingers along the sides and front of your body, a few inches below your heart. If you breathe in deeply, you can easily feel your ribs right in the front of your body, too. Some thin kids can even see a few of their ribs right through their skin. Your skull protects the most important part of all, the brain. You can feel your skull by pushing on your head, especially in the back a few inches above your neck. The skull is actually made up of different bones. Some of these bones protect your brain, whereas others make up the structure of your face. If you touch beneath your eyes, you can feel the ridge of the bone that forms the hole where your eye sits. Sure, your arm, wrist, hand, and finger bones are great for picking up the phone, but how are you supposed to run to answer it? Well, with the bones of the legs and feet! Your legs are attached to a circular group of bones called your pelvis. The pelvis is a bowl-shaped structure that supports the spine. It is made up of the two large hip bones in front, and behind are the sacrum and the coccyx. The pelvis acts as a tough ring of protection around parts of the digestive system, parts of the urinary system, and parts of the reproductive system. Protect those skull bones (and your brain inside!) by wearing a helmet for bike riding and other sports. When you use a skateboard, in-line skates, or a scooter, be sure to add wrist supports and elbow and knee pads. Your bones in these places will thank you if you have a fall! If you play sports like football, soccer, lacrosse, or ice hockey, always wear all the right equipment. And never play on a trampoline. Many kids end up with broken bones from jumping on them. Broken bones can eventually heal, but it takes a long time and isn't much fun while you wait. Strengthen your skeleton by drinking milk and eating other dairy products (like low-fat cheese or frozen yogurt). They all contain calcium, which helps bones harden and become strong. Be active! Another way to strengthen your bones is through exercise like running, jumping, dancing, and playing sports. Join in and write your own page! It's easy to do. How? Simply click here to return to Interesting facts about humans.